DO YOU OR SOMEONE YOU KNOW HAVE HEMOPHILIA A? JOIN US FOR DINNER! Join us for dinner on June 14th in Long Island. You’ll meet Dawn Hezel, RN, MS, CPNP/CPHON of Four Seasons Medical of Western New York from Buffalo, NY and Mily Cepeda, a parent advocate from Summit, NJ. You’ll also learn more about AFSTYLA. 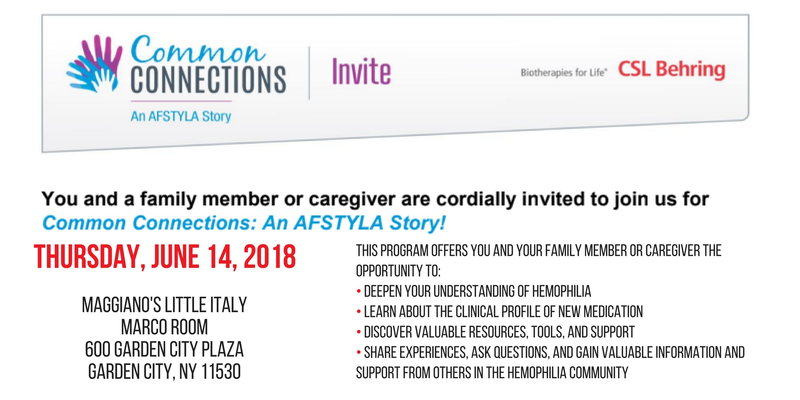 This program offers you and your family member or caregiver the opportunity to:• Deepen your understanding of hemophilia• Learn about the clinical profile of new medication• Discover valuable resources, tools, and support• Share experiences, ask questions, and gain valuable information and support from othersin the hemophilia communityAnyone under 18 years of age must be accompanied by a parent or caregiver. This dinner and program have been generously sponsored by CSL Behring. Questions? Concerns? Can’t make it but want to know more? Email Krystle Cheirs-Roberts at krystle.roberts@nyhemophilia.org.